Aaron Sorkin takes his first seat in the director’s chair with the high stakes poker themed crime thriller Molly’s Game. The main thing Aaron Sorkin has become known for over the years is the way he writes his dialogue. This was made famous by the TV show The West Wing and was at the root of successful Hollywood movies such as The Social Network and Steve Jobs. I must admit I was surprised to realise that he had never directed a film of his own and he does such a good job with this one that you’d be forgiven for thinking this is far from his first. Based on the memoir of the same name about an ambitious overachiever who quickly masters running high stakes underground poker games for rich and famous before becoming part of an extensive criminal investigation connecting her to her less than scrupulous clients. Jessica Chastain plays the Molly of the title and takes to the rapid fire Sorkin dialogue wonderfully. There’s a lot to take in about her at all times with the early part of the film taking the viewer on a very quick tour of her early life, familial relationships and the events that motivate her desire to be on top at all times. Chastain’s performance successfully bring across all of these attributes and these early scenes are important in establishing that there’s more to Molly than the carefully guarded persona much of the film shows us. Otherwise she might seem one note but there’s a lot of depth to the character that definitely comes through thanks to seeing other parts of her life. 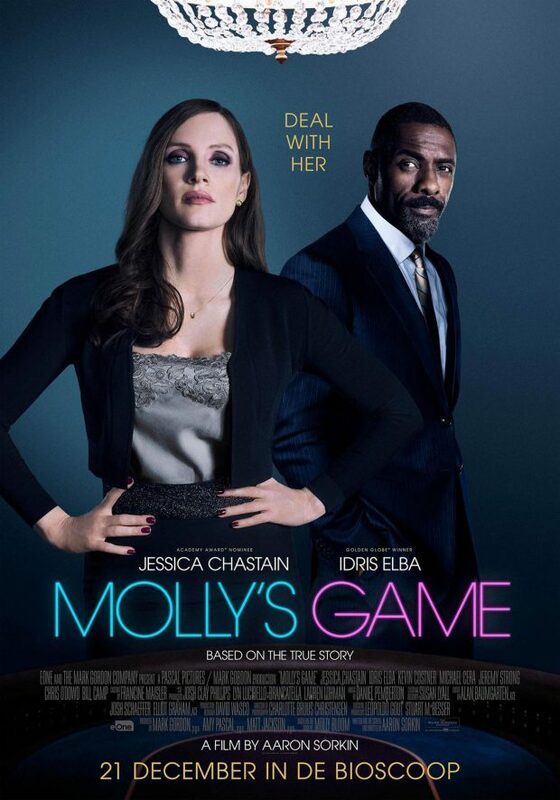 The story is told through Molly recounting the tale -with some names altered- to her lawyer Charlie Jaffey (Idris Elba) who doubts her ability to pay for his services and keeps pushing her to use the information she has to protect herself. These scenes are great because Jessica Chastain and Idris Elba bounce off one another so wonderfully. Any scene featuring the two of them is a joy to watch and their slowly developing professional relationship forms the core of the narrative. His insight allows Molly’s integrity to come through clearly and helps clear up the details of the events in a cohesive easily digestible narrative. Idris Elba is great in his own right as well with less of his character developed though hints of what motivates him to be a better person through his relationship with is daughter Stella (Whitney Peak) and the generally morally upright way he looks at the information he is given. He also gets an excellent monologue showcasing how well written the dialogue is along with Elba’s ability as a performer. The flashback storytelling is both stylish and clear. I have no idea how to play Poker which doesn’t matter in this film as Molly’s narration explains what’s going on in a given scene very well which greatly adds to the tension thanks to the combination of performances and knowing exactly what each side stands to lose if the hand isn’t a winning one. This method turns the potentially alienating Poker sequences into one of the films strengths thanks to the presentation and delivery of information. Other characters come and go as needed and only exist to service Molly’s story. Some stick around more than others such as Michael Cera’s Player X who drives the games and takes pleasure in the misery of others, Dean Keith (Jeremy Strong) who introduces Molly to this world, Brad (Brian d’Arcy James); a rich guy who is terrible at Poker but likes to spend time with others, Harlan Eustice (Bill Camp); someone with a seemingly infinite pit of money and actual skill at the Poker table and Douglas Downey (Chris O’Dowd); a drunken Irish businessman with lots of connections. There are other characters but they stand out more than most mainly because the roles they play in the story propel it forward. The acting is strong across the board but particular attention should be paid to Michael Cera who capably plays against type and Chris O’Dowd who sheds his more comedic persona for a more pitiable character. Despite how slickly presented and watchable this experience is it does go on a little too long. Molly’s relationship with her father Larry (Kevin Costner) is shown to be an important one and part of what drives her but there’s less focus on it than there really needs to be. There’s a moment towards the end that is supposed to act as a moment of catharsis for each of them but it doesn’t quite land as the film hadn’t previously done the work to really build the tension between them. Flashbacks do set it up to some degree but by the time the resolution comes their relationship has been off screen for a while and it feels unearned. A slickly presented compelling character study with an excellent leading performance from Jessica Chastain and an equally impressive supporting performance from Idris Elba. Both take to Aaron Sorkin’s trademark rapid fire dialogue wonderfully and the story is told in a neat easy to follow way. Using flashbacks to show different parts of Molly’s life flesh her out as a character beyond the persona she exhibits for the majority of the film and the narrative device of the events being a story she tells her lawyer is well used. Molly’s explanation of the minutiae of the Poker sequences combines naturally with excellent acting to develop tension. The film trips up somewhat on the relationship between Molly and her father that comes to a catharsis that feels somewhat unearned. Despite that this is a compelling watch that is consistently captivating.